On a door stoop in Kenmore Square near Boston University and Fenway Park, one could almost always find Melvin. And if he were gone for a little while, his stuff might still be piled up there, neatly folded and organized. Melvin has been a fixture there for at least the few years that I've been at BU. Sadly, I never had much of a conversation with Melvin. I'd pass by, drop some money into his donation cup or provide him with some leftover pizza. The other day I went out for pizza nearby to Melvin's spot and the person I was with said, "Did you see that? There's a sign on the stoop that says, RIP Melvin." I regret now that I never took the time to know Melvin. On more than one occasion, I was touched to see students from the BU Catholic Center sitting with Melvin, conversing with him, laughing with him, arms around his shoulder, and having a great time. For many of us who passed him by on a daily basis--busy going to lunch or home from lunch--Melvin was an opportunity to give to the poor. But for some of the students at the BU Catholic Center, Melvin was a person. He was a sign of God's presence in the world. In taking time to talk to Melvin, those students encountered Christ. Perhaps some of them never gave Melvin money. But, they gave him love. And, from the looks of them as they conversed with him, Melvin gave them love too. Melvin seemed to love that door stoop. It makes me wonder now if his main reason for being there was not to beg for money or food, but to beg for love, for human contact, and for friendship. Perhaps what he was truly begging for was to be part of our lives. Come Monday morning, students will be hustling to and from classes, buses, trolleys, and taxis will be making their way through Kenmore Square, and people on their way to and from lunch will rush by the stoop where Melvin sat and greeted people. A presence will be gone. 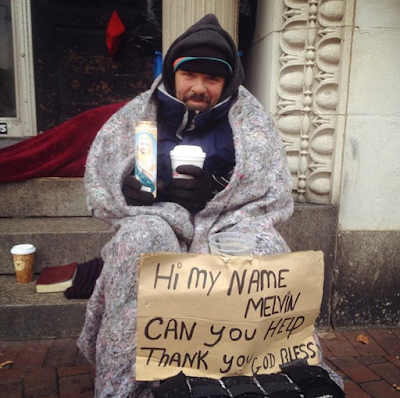 Whenever I saw Melvin, I thought about him as being "the poor." But with his passing, I have a sense that Melvin was the rich one and those of us who didn't take the time to know him were really the poor. Jesus says, "Blessed are the poor for theirs is the kingdom of heaven." The Gospel this Sunday is about a man named Bartimaeus who sat at the side of the road, begging. I will offer my Mass for our Melvin and pray that he who only possessed a small door stoop in this life will now be housed in the mansions of heaven. I will also pray that more of us become like the students at the BU Catholic Center and will not be blind to the persons whom God places in our path. Mercy: Someone Died for Me. Now What? Ever since I was a young boy, I loved movies about World War II. Even though I loved so many of the great black and white movies made long before I was born, one of the truly great films about World War II has to be, Saving Private Ryan. The scenes covering the D-Day invasion itself are captivating. You will recall that the film's plot revolves around an Army unit sent to find and bring to safety a young man named, Private Ryan. Private Ryan's three brothers have all been killed in action and the Army is determined--even in the midst of all of the chaos of the D-Day invasion--to find Private Ryan and return him safely home so that his mother does not lose all of her sons. In the process of saving Private Ryan, almost the entire unit is killed. Towards the end of the film, the commanding officer of the unit is mortally wounded and his dying utterance to Private Ryan is, "Earn this." In other words, "All of these men lost their lives in order to save your life, so live a life that is worthy of such a sacrifice." This scene came to mind as I thought about the words from the Prophet Isaiah today. Isaiah, in foretelling Christ's death, said that he was "crushed in infirmity" as an "offering for sin." Christ died for me. Do we think about this every day? Do we think that someone died for me? Someone gave their life for me so that I could live? Do I think about that? It is true that none of us ever could "earn" what Christ did for us. None of us will ever pay him back or be deserving of his sacrifice. But, at the same time, his sacrifice for us deserves a response. I should constantly be aware that a man died for me. And not just any man. The Son of God himself died for me. Do I live in a way that respects that fact? I often wonder if many of us hear the language of mercy and misunderstand it. I think when many people who were raised in my generation and after hear about mercy, we think that it means that God looks down and sees our sins and chooses to ignore them. We act as though God is way up in heaven looking down and saying, "Yeah, that David Barnes is a total mess, but out of mercy I will just leave him being a total mess and kind of look the other way." But, this is not mercy! God reached down to us in mercy. He reaches down and lifts us out of our mess! Mercy means that someone died for me! Christ did not die for me so that he could leave me in my sins. He died so that he could reach down and pick me up from my sins. He reached down so that he could lift me up. Mercy means someone died for me. Mercy means that Christ carries our humanity into the sanctuary of heaven. In the opening prayer of today's Mass, we asked God to "grant that we may always conform our will to yours." This is what Christ's grace and mercy do for us. His grace and mercy lift us out of our sinfulness and enable us to conform our will to the will of God. They make us able to live a life worthy of our calling. Certainly we don't earn what he gives to us, but his mercy and grace do not leave us in our sins, but rather lift us up. Christ didn't die for us so that we could safely lead a life of sin. He died so that he could lead us from sin and bring us to God. 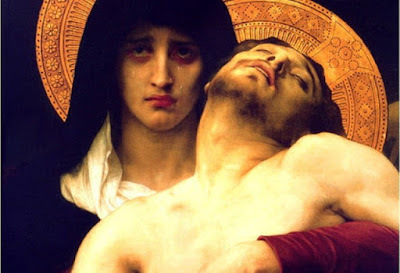 This week, let us keep constantly before us the image of Christ on the crucifix. This is true mercy. A man--the Son of God--died for me. He gave his life for me so that I could rise above my sinful way of life and have union with God. Christ is a priest. He enters the sanctuary of heaven robed in our flesh. He is robed in our wounds and weaknesses. He enters victorious into heaven because he has conquered everything that holds us down in the mud. Each of us has our own weaknesses and struggles. Pride, Anger, Lust, Envy, Gluttony, Avarice, and Acedia are the usual suspects. As we remember Christ crucified, it's true that we can't "earn" what he's done for us, but we can respond appropriately to so great a gift. This week, let's choose one thing that we will do that will allow God's grace to help conform our will to his. If we are prideful, maybe we can hold back our opinions this week. It always comes as quite a shock to me that when I don't offer my opinion, somehow the world still manages to go on! Or, if Anger is our affliction, let's practice patience this week with the people close to us or give up blowing our horn in traffic! If lust, let's practice maintaining custody of our eyes--not looking at impure images and not looking at others as objects. If envious, let's practice saying kind things about the people of whom we are envious. Gluttonous: give up various foods each day or limit alcohol consumption. If greedy, make sure that each day I am generous with my resources. And if spiritually lazy, wake up fifteen minutes early each day and pray or make sure that your first conversation each day is with God and not with Facebook, Instagram, Twitter, email, or texts! Okay, just seven suggestions. Pick just one and practice it for a week! Or pick your own. You've got the idea. Someone died for us. He died not to leave us dead in our sins, but to lift us up from them. He died so that we could come home safely to heaven. So, let's allow His Mercy to pick us up and to carry us all the way to the Father's House. As the bishops gather in Rome for the Synod on the Family, there is a phrase being used that can sometimes be interpreted incorrectly. It is said that this Synod is not about "doctrine", but rather about finding "pastoral solutions." For the outside observer--and even for many within the Church--this can make it sound as though doctrine exists exclusively way up in some unattainable cloud and that the "pastoral" exists down in the weeds of every day life, unaffected by doctrine. Pastoral solutions, however, are not the opposite of doctrine. Pastoral solutions are about helping persons to live the truth of the doctrines, not creating safe havens from those doctrines. If the Synod intends to provide pastoral solutions, it needs to do so by helping people to live the doctrines. The doctrines are not oppressive. They are beautiful! We all fall short of living the full Catholic life. 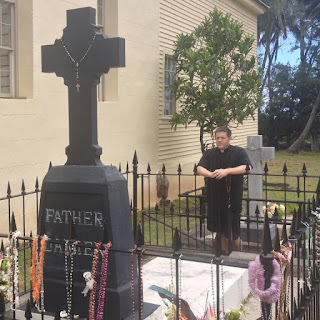 The good pastor is not the one who finds creative ways around living the full Catholic life. The good pastor is able to find the best way for the particular wounded person in front of him to live the Catholic life in all of its fullness. While the current situation has been focused upon the pastoral care of the divorced and remarried and their reception of the Eucharist, I'd like to offer another example. I realize that every analogy necessarily falls short. I offer this example not to equate it with the issue of the divorced and remarried, but simply as an analogy. The Gospels teach that we must forgive our enemies. Every pastor has been approached by persons who have acknowledged that their heart is filled with hate. Perhaps the person hates a politician or perhaps the person hates his spouse, a parent, family member, priest, bishop, friend, acquaintance, or stranger. Perhaps when we hear the person explain the situation, we can easily understand why he or she has reacted so strongly. We hear the story and feel a closeness to this person. Perhaps they were unjustly or viciously treated. We can totally appreciate why they feel the way that they do. The reason that the person is in front of us in this moment is because the Scriptures are filled with admonitions, teachings, and instructions stating that the disciple of Jesus must forgive. The person in front of us might be filled with a hatred and an unwillingness to forgive. They know that there is a gap between what Jesus demands and where they presently are. In that moment, the good pastor is the one who is able to assist that person to move from hatred to love. Sometimes it would be easier to tell that person, "Hey look, that person was a jerk to you. God can't possibly expect you to love that person after what he did to you." But, that is not a pastoral solution. A pastoral solution that is detached from the doctrine or seen as an alternative to the doctrine is not a pastoral solution. A pastoral solution is one that leads the person to live the fullness of the doctrine. In this example, the true pastoral solution will be to help the person move from hatred to charity, from bitterness to forgiveness, from anger to peace. Separating the pastoral from the doctrinal is to surrender hope that the person in front of us is able to live the full truth of the Gospel. In the example above, separating the pastoral from the doctrinal would be to say, "This person has been so wounded that it is best to leave him in hatred, bitterness, and anger. After all they've been through, it is impossible for them to live a life of charity, forgiveness, and peace." But this is not a true pastoral program. A true pastoral program does not leave the patient hopeless of ever regaining health. A true pastoral program acknowledges the deep wounds that are present, diagnoses the causes, and prescribes the best possible method to restoring full health. Those who draw too much of a distinction between doctrine and pastoral care should exercise great caution. The two are intimately linked. The doctrine has to shape our pastoral practice and our pastoral practice--to be worth anything at all--must lead to a fuller living out of the doctrine. The joy of the Gospel is not only discovered in the doctrine itself, but also in the amazing truth that by grace, we--wounded and weak--can live in accord with that doctrine! 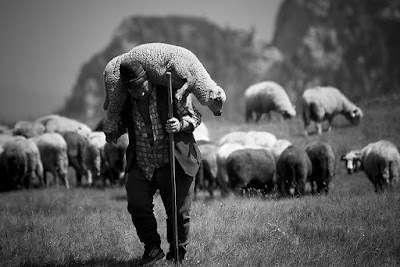 The Good Shepherd--the one who provides true pastoral solutions--loves us so much that he takes the wounded sheep upon his shoulders and carries him to the green pastures of solid doctrine. 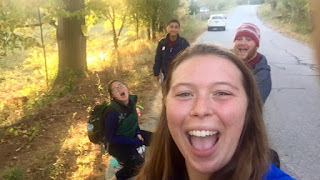 After an exhausting retreat this past weekend with 70 BU students, I thought that our intern, FOCUS Missionaries, and I needed a day off, so the Catholic Center was closed on Monday. 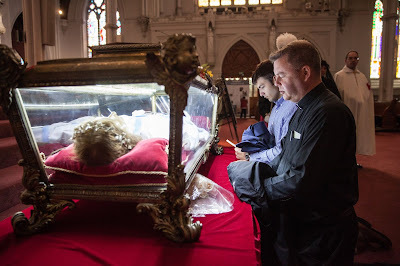 Around Noon, I met up with Joe, our intern and we had Mass together before walking to the Cathedral of the Holy Cross in Boston in order to venerate the relics of St. Maria Goretti. If you do not know the story of St. Maria Goretti, it is a beautiful testimony to purity and to the power of mercy. While kneeling there, I especially prayed for all of the young people (and especially young women) I've encountered at the BU Catholic Center and in my previous assignment. I also entrusted some vocations to her intercession. In the evening time, the parents of one of our FOCUS Missionaries treated all of us to dinner. It was a great evening with a lot of laughs. At the heart of our First Semester events is our Fall Retreat. The retreat is put together by six students along with out intern, Joe. They not only organize the theme of the retreat, but they also attend to the million details that are part of such a huge undertaking. One of the best parts of preparing for this retreat was seeing our FOCUS Missionaries, retreat team, and intern all on their phones reaching out to students whom they have met or students who had mentioned on their registration cards that they'd like to go on a retreat with us. I think one of my favorite moments on retreat was when one of the new students said, "Father, thank you for making me come on this retreat." Occasionally I apply a little bit of pressure to help people make the right decision about coming on retreat . . . . 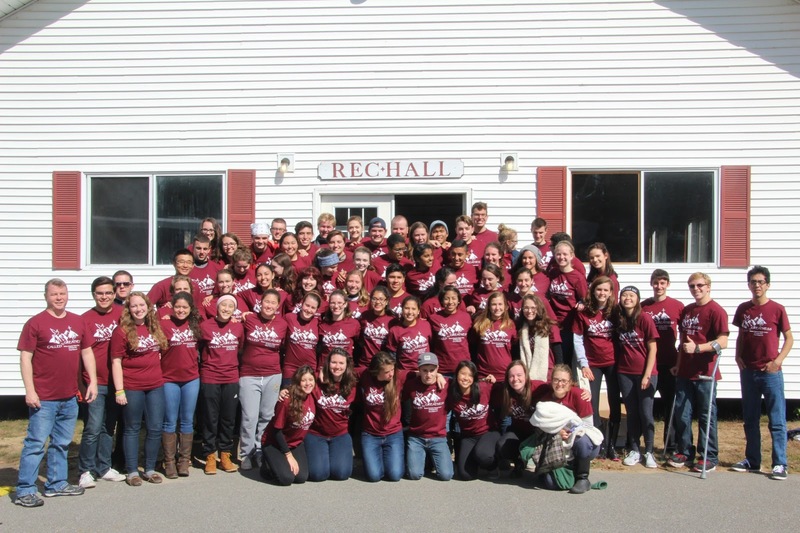 The Fall Retreat takes place in a beautiful location in New Hampshire. It is beautiful, but it is freezing cold! Built as a summer camp, the cabins are unheated and in October, that means it is very cold! A week before the retreat, the weather was predicting massive rain storms. That would have been a disaster! We, however, were saved and while cold the first two days, we were spared the rain. On Sunday, the sun was shining and 55 degrees felt like a warm summer day! 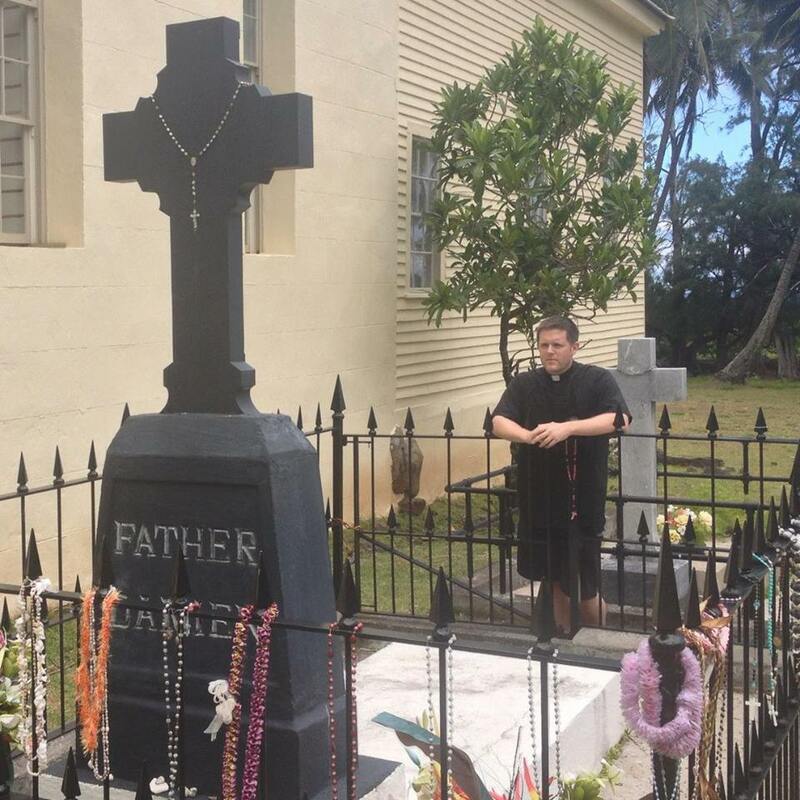 priest in the Archdiocese of Boston and is currently assigned to the Vocation Office. He gave some wonderful talks, provided a prayerful example, hung out with the students, and spent a couple of hours of free time playing football with some of the retreatants. One of the great joys of priesthood for me is introducing great people to one another. I felt very proud to introduce Fr. Eric to our community and to introduce our community to Fr. Eric. I think it is safe to say that by the end of the weekend, there is a mutual love between them all. In addition to Fr. Eric's conferences, two students and one FOCUS Missionary gave witness talks about how Christ has worked in their life. These witness talks--that are a staple of our retreats--are always amazing. It is so encouraging to hear people share their testimony. At the end of the retreat, one of the busses transporting students broke down. All but three of our students and one FOCUS Missionary were able to squeeze into one bus. Those four volunteered to remain behind and wait for a couple of more hours to be picked up. Their example of joyful generosity and service to others is typical of these four and a great witness. For the most part, I tend to use this blog as the place where I offer my witness. It is the place where I am able to point out specific examples of living the joy of being Catholic and living the joy of being a priest. The specific place where I encounter Christ today is among these university students and our small staff who serve here. If the Church is supposed to be a place where people are welcomed and experience Christ's love, then the Church is alive and well here at Boston University. If every parish in the United States had just a fraction of what these young men and women are living together, the Church would be growing exponentially. I am privileged to live this experience with them. I hope that you are encouraged by what you see here. I wish I could explain it better, but there's just too much to say and too few words to say it. As a priest, I feel like it is my responsibility to be the first one who is surprised, moved, and awed by what Christ is doing. My repeated experience is that when great things are happening in the life of a Catholic community, it is not because we caused it or figured it out. It is because we have obediently followed where the Spirit moves us. As I survey what God is doing among us here, I am surprised, moved and awed. After eighteen years of priesthood, it makes me so happy that I wake up every day and am still constantly surprised by God's goodness.